Collage made from Higgledy seeds, starring nigella ‘Persian jewels’ as soil, cosmos ‘Purity’ as stems, calendula ‘Indian Prince’ as leaves and petals and sweet pea ‘Perfume Delight’ as flower centres. Seeds. They’re astonishing. Like teeny biological TARDISes. 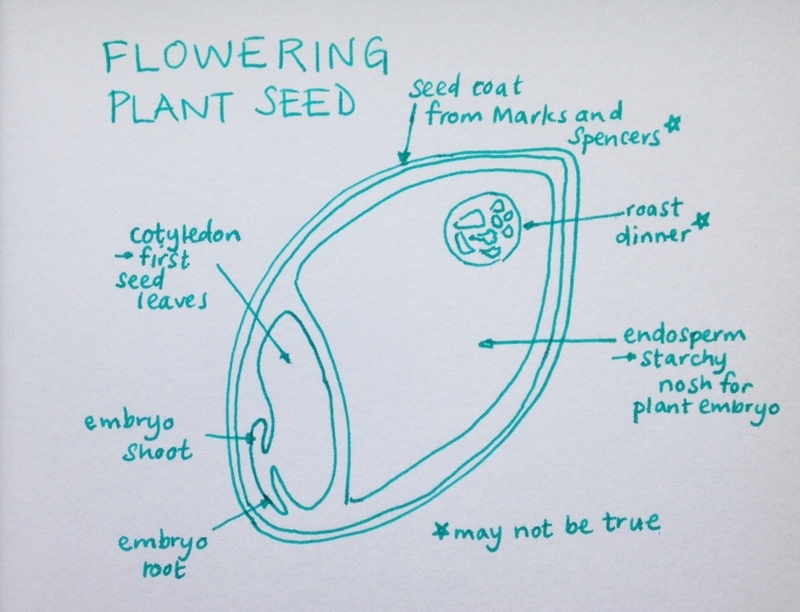 Whilst at college, in the days of yore (1991) I studied seeds for a term or so. I was extremely nerdy back then and wrote at least four essays a week. Most of them were about DNA. I wish I’d got out more to meet boys. I learned during my scientific geek-outs that despite looking so dry and unpromising – like tiny nubbiny pieces of bark or little woody spheres – inside each seed is a miniscule embryo and all the three course dinners ( in the form of starch) it needs to fuel its growth into a full-sized flowering plant. Wowsers handmade trousers. The plant grows from spesh places in the embryo called meristems where LOTS of cell division goes on. I like the word meristem. It makes me feel merry. Every time I plant seeds in Spring I peer at them sceptically. Will they really grow into sunflowers and cornflowers and marigolds? Really? 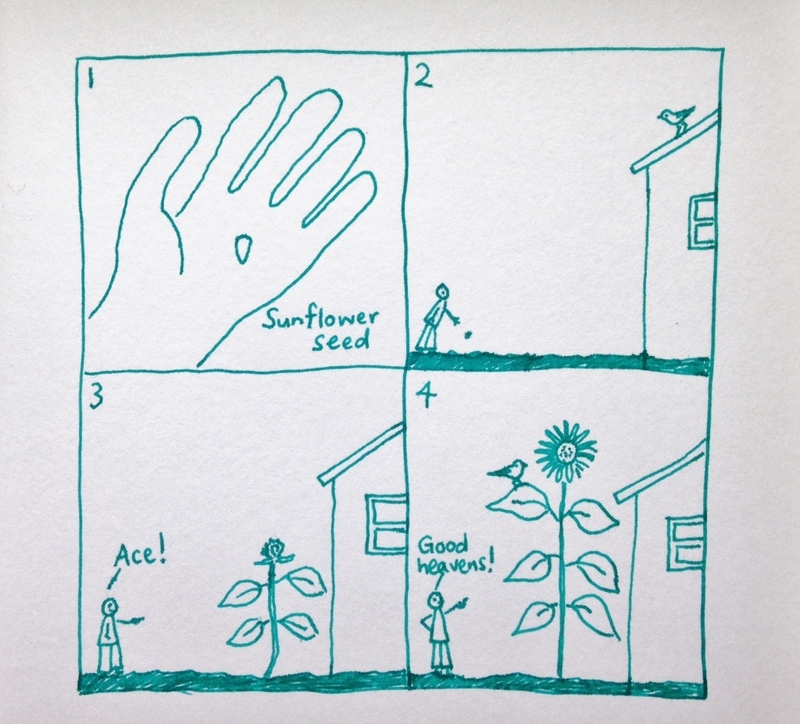 A sunflower seed is weeny, an insignificant speck in a flapjack, yet sunflowers can grow to be taller than a house. Does this not somehow defy the law of conservation of matter? Is Derren Brown involved? But no, it is the wonder of soil and sun and water and plant cells doing their marvellous thing with all three. I find cosmos one of the most mind-boggling. The seed is so skinny, dry and shrivelled-looking yet they germinate to form such tall graceful, ferny, floaty, wafty numbers. It is planty magic of the purest kind. A mosaic of cosmos floofiness. Plus a hoverfly. I’ve heard tell from a reliable source (Sir Higgers de Garden himself truth be known) that seeds sown now will still flower this summer. I had no idea about such things, being a newbie, but I find it heartening news indeed. 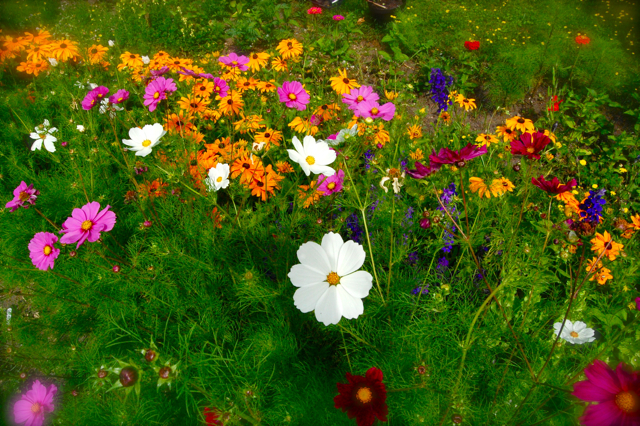 I bunged some into the ground just days ago: borage, Eschscholzia, calendula, even cosmos. The latter is an experiment. I’ve been told that they prefer to be started in pots. We shall see how things turn out. If you don’t hear about their progress here then they carked it. So, if you’d still like a cut flower patch to charm the wotsits off Bernard down the road or make your vases very happy indeed why not start one this very weekend? It’s not too late. Here is the Higgers shop of seedy magic and wonder*. *Disclaimer: Derren Brown not included in any Higgledy purchase. Sorry about that. Emma lives in a tiny pink cottage on the edge of the Fens and makes things out of silver in a hut at the bottom of her garden. Her jewellery designs (mostly inspired by the flowers and plants) have been featured in Country Living magazine, in Kirstie Allsopp’s book ‘Craft’ and are available in the Cambridge Botanic Garden shop. She has written for the Guardian and Sarah Raven’s lifestyle blog. She rarely ventures out of the house without her camera, collects vintage cardigans and is a fan of hedgerow liqueurs. Here’s her website. 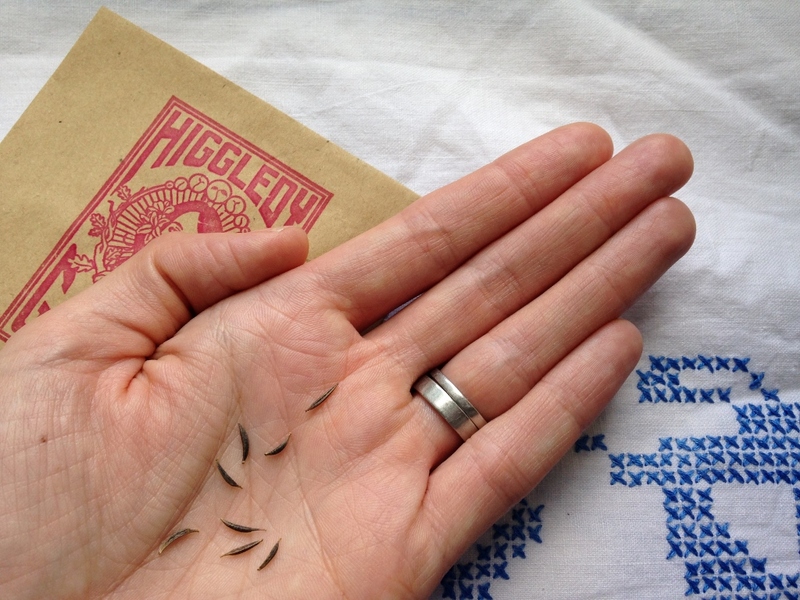 Sweet William: How To Grow From Seed. 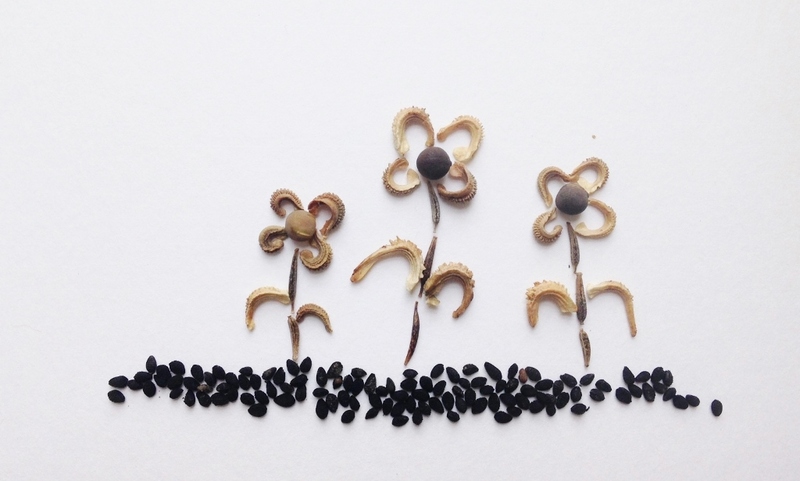 Seeds As Wedding Favours. Oh and is it possible to subscribe to your blog? Would be really useful as a reminder of what to do and what to buy. Hello, this is such a lovely site and so much useful info. Thank you, it’s invaluable for a newbie like me with a large garden, laid mainly to lawn right now but I intend for that to change over the next couple of years! Can’t wait to do a bit of June planting and get ahead of the game for next year. I’m a Higgledy newbie too so love this. Planting out my cosmos today. Nice to see how they will look in a few weeks time!